Asian and Pacific Islanders with Disabilities of California will present its first annual Awards Gala on Saturday, Oct. 25, at Cicada Restaurant, 617 S. Olive St. in the historic Oviatt Building in downtown Los Angeles. APIDC’s Lifetime Achievement Award will be bestowed upon former U.S. Secretary of Transportation Norman Mineta for his role in supporting the historic passage of the Americans with Disabilities Act. This is a unique opportunity to recognize Mineta’s many contributions to the country in various capacities. AT&T, a great supporter of APIDC, will be receiving the Corporate Leadership Award. Proceeds from the gala will be used to support APIDC’s outreach and educational services, including its Youth Leadership Institute and 2016 statewide conference. Since 1999, APIDC has been a unique bridge between the Asian communities —traditionally underserved due to language and cultural barriers — and mainstream agencies and organizations serving people with disabilities. APIDC is a non-profit advocacy organization dedicated to raising the visibility of APIs with physical, mental and developmental disabilities, an underserved population in employment, education, health and social services. Believed to be the only organization of its kind in the country, APIDC was created because many families and people with disabilities are not familiar with available resources, and because many mainstream agencies serving people with disabilities find it difficult to access Asian communities. APIDC convenes statewide conferences, which bring together consumers and service providers to network with each other. The conferences have been attended by hundreds of people who have reiterated the need for such conferences for information sharing, support and social networking purposes. APIDC also conducts smaller seminars to educate people about services, and provides a Speakers Series highlighting APIs with disabilities who have become local and national leaders. One of APIDC’s newest programs is a Leadership Institute where college students with disabilities are taught public speaking, media, advocacy, organizing and fundraising skills to become future leaders. VIP reception at 4 p.m., cocktail reception at 5 p.m., program at 6 p.m. Valet parking. The venue is ADA-accessible. Tickets are $150. Seating is limited to 370 guests. For more information, call (310) 428-2885, email [email protected]@gmail.com or visit http://apidisabilities.net. Born and raised in San Jose, Mineta as a young child was among thousands of Japanese Americans interned during World War II. He received his undergraduate education at UC Berkeley, then served in the Army. He then returned to San Jose and began his public service, first as a city councilman, and in 1974 became the first Asian American mayor of a major U.S. city. During his first week as mayor, he accepted a request from a friend to experience daily life in a wheelchair, an experience he reflected on while working on the ADA many years later. Mineta went to serve in the U.S. House of Representatives for 20 years, chairing the Subcommittee on Aviation and the Subcommittee on Surface Transportation and then chairing the entire House Transportation and Public Works Committee. He was primary author of the Intermodal Surface Transportation Efficiency Act of 1991, which greatly changed transportation planning and policy, and was a key architect of the transportation section of the ADA by working with disability rights organizations. Mineta has also been deeply committed to raising the visibility of Asian Pacific American issues, and co-founded the Congressional Asian Pacific American Caucus. He moved on from Congress to become vice president of Lockheed Martin. In 2000, he was appointed secretary of commerce under President Bill Clinton, becoming the first Asian American to serve in the Cabinet. 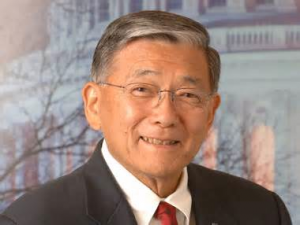 The next year, President George W. Bush appointed Mineta as secretary of transportation, where he oversaw the creation of the Transportation Security Administration after 9/11. During the Bush Administration, Mineta continued to work to make strides in improving the accessibility of the national transportation system and convened the first meeting of the Coordinating Council on Access and Mobility. In 2006, Mineta was awarded the Presidential Medal of Freedom, the nation’s highest civilian award. He recently retired as vice chairman of Hill & Knowlton, and remains active in supporting countless non-profit causes, including the Japanese American National Museum. APIDC is grateful for his service on its Advisory Council.